We've teamed up with Pacific Surf Company to offer you some super awesome adventure options. Pacific Surf Company offers the most comprehensive and friendly surf lessons in Tofino! Fun, safe and suitable for all levels, you can hit the waves year round, and customized to your comfort. Gear up for a 3hr experience at one of the many beautiful beaches in Tofino. Our guests receive 10% off all lessons. SUP lessons are a great way to spend a day cruising around the coastal waters near Tofino. Pacific Surf Company will guide you along beautifully rugged shorelines and teach you basic paddling strokes or more advanced techniques. You might also get a chance to get up close and personal with some of the local sea life! Our guests receive 10% off all lessons. 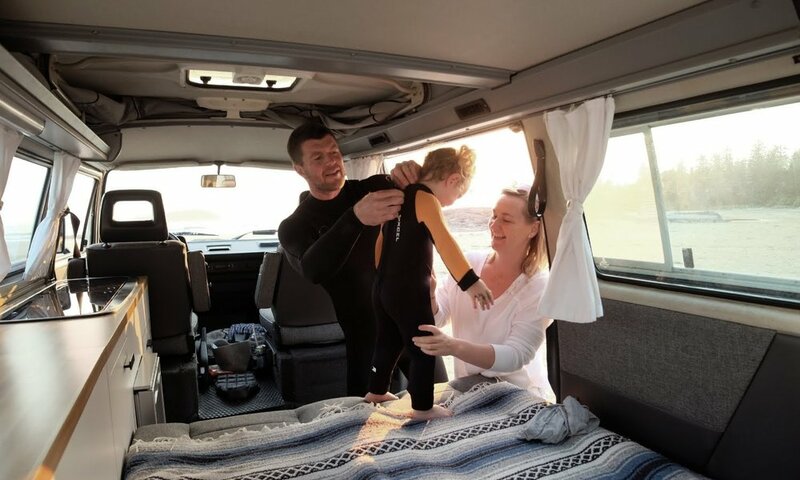 If you already know how to surf, but just need the right gear to make the most of your Tofino experience, Pacific Surf Company has you covered! They offer only the best wetsuits, boards and gear, and are always happy to share in-depth local knowledge. Our guests receive a 24 hour rental for the price of a 6hr rental. Sweet deal! Pacific Surf Company offers custom designed merchandise, all with locally designed graphics. All retail products are carefully chosen from suppliers to meet high ethical and environmental standards. Find everything from tees to sweaters, mugs to socks, and more to take home a keepsake of your time out on the coast. Our guests receive 10% off all retail items, online or in store! Pick-up your Honest Camper from Vancouver. Head to Horseshoe Bay and catch your ferry to Nanaimo. Hit the Old Country Market in Coombs for some guilty pleasure snacks and wind your way through Cathedral Grove, an old-growth forest with some seriously large trees. When you arrive in Tofino pull-up to your reserved campsite at Bella Pacifica Campground (TBC) with magical views and heated showers. Pop over to Rhino Coffee House (TBC) and have the locals thinking that you're one of them as you throw down your Rhino 20% off discount card. Make your way into town and meet the awesome staff at Pacific Surf Co. They know the vans and will be expecting you. Experience a private surf lesson or a family surf lesson. This is a great time of year to go as the waves are the best, it's not quite as busy, and the wetsuits keep you warm. Dry off and head across the street to Tofino Resort & Marina (TBD) where you can park your ride and head in for an apres-surf soak in the hot tub. Ahhhhh. Hit Rhino Coffee House (TBC). No need for your card this time, you're a regular now. The day is yours! 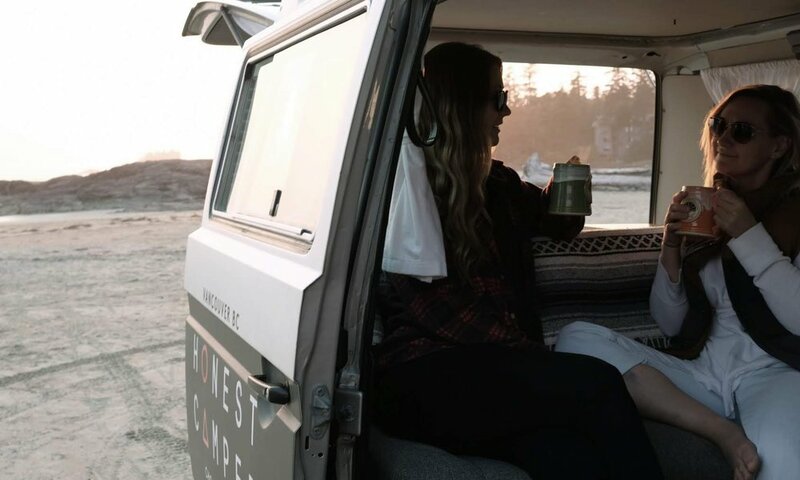 You've got the option to pop over to Pacific Surf Co, say hi to the now familiar faces and rent some gear and head back at it, or spend your day under a warm and cozy blanket in your camper as the waves crash nearby. Head back to Vancouver with new surfing skills, memories, and hashtag worthy pics.